In a large crock combine 1 quart Cream Soup Base (Crème Potage) and 1 quart Three Cheese Mac & Cheese Sauce. 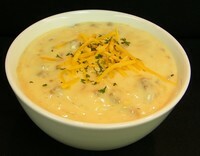 Cover and refrigerate remaining cream soup and cheese sauce. Brown beef and onions together. Drain off excess fat. Add meat and onion mixture and potatoes to crock and stir to combine. Let sit for 20 minutes before serving. Heat to 165° F and serve. NOTE: Cream Soup Base Mix (Crème Potage) yields 1 gallon of base. This recipe uses 1 quart. Store remainder tightly covered in refrigerator for up to 5 days. NOTE: Three Cheese Mac & Cheese Sauce Mix yields ½ gallon of sauce. This recipe uses 1 quart. Store remainder tightly covered in refrigerator for up to 5 days.